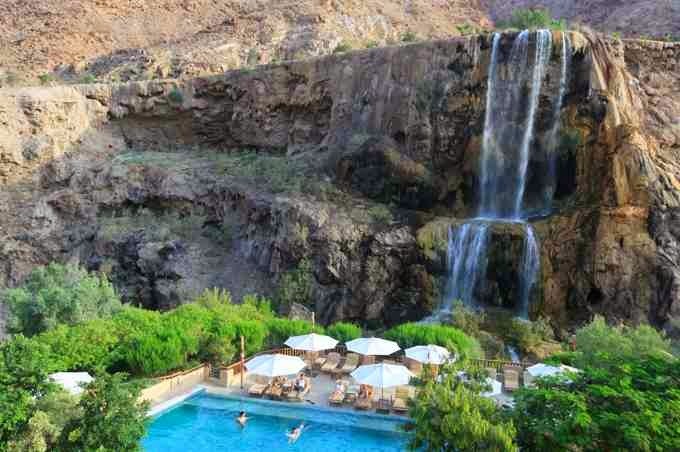 In Jordan, there are many old places still attract large numbers of tourists, the most important area is Hammamat Ma'in and the hot springs around it, also known as Zarqa Ma'in, is a series of hot springs and waterfalls. Ma'in springs located between the Dead sea and the town of Madaba, an hour's drive from the capital city of Oman, below sea level by 264 metres. Spring water is effective in treating many diseases because it contains large amounts of hydrogen sulfide, the springs still a source of hot water ,which gained its heat from lava in the underground. Ma'in water gushes from the summit of a high mountain to deep valley, at temperatures ranging from -40 to 60 ° c, like a panoramic panel blends colors between green land and transparent waters, its charm reflects on the comers when they see this panel . tourists are intended springs Ma'in Jordanian to relax ,enjoy ,and healing of rheumatic diseases ,muscle spasm ,back pain, cardiovascular disease ,skin allergies, sinusitis, chronic joint and muscle pain ,and tendinitis. Of the advantages of ma'in springs proximity to the dead sea in an area called Wadi Mujib, accessible by a road, like no road in Jordan, is full of meandering and curves, the waterfalls look from afar for tourists landing from the high mountains, and every winter the rainwater coalesce from the high mountains of Jordan in this oasis and are heated by the hot lava under the ground , and then gather at Zarqa River. Hammamat Ma'in surrounded by towering mountains look like a framework protects the area, and down these mountains caves formed by limestone sediment , making it a integrated natural panel ,beside the sound of the waterfalls dropping above the stones that endure the heat of this water, and once it landing on the tourists's bodies cure their maladies ,from skin diseases, bone, etc, if the destination not therapeutic ,don't mind taking a psychological relaxation and entertainment session in clinic entitled nature and its medicine in Ma'in water . You can enjoy the hot waterfalls ,either in an open place available to everyone for free, or through luxury resorts built around it ,the best known :Evason Resort & Six Senses Spa , which features a swimming pool at the bottom of each waterfall, making it like a sauna, and sit in your room to the sound of trickling water of waterfalls which are located in front of the resort, as well as many activities such as mud therapy, water jet Spa, and electrolysis beauty treatments .